All FOCA members can redeem a one-time FREE 1-year Individual Membership to the Canadian Canoe Museum. FOCA Members may click here for the FOCA access code and ways to redeem this offer. Canoes and cottagers – of course! In a recent FOCA survey, two-thirds of respondent members reported that they canoe regularly, and 90% of them own at least one canoe. 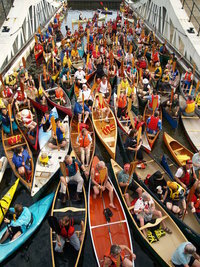 FOCA is very pleased to partner with the Canadian Canoe Museum, filled with fellow canoe enthusiasts!